"We were always glad to see the 80th." The Outpost - Offical magazine of the 80AAA. 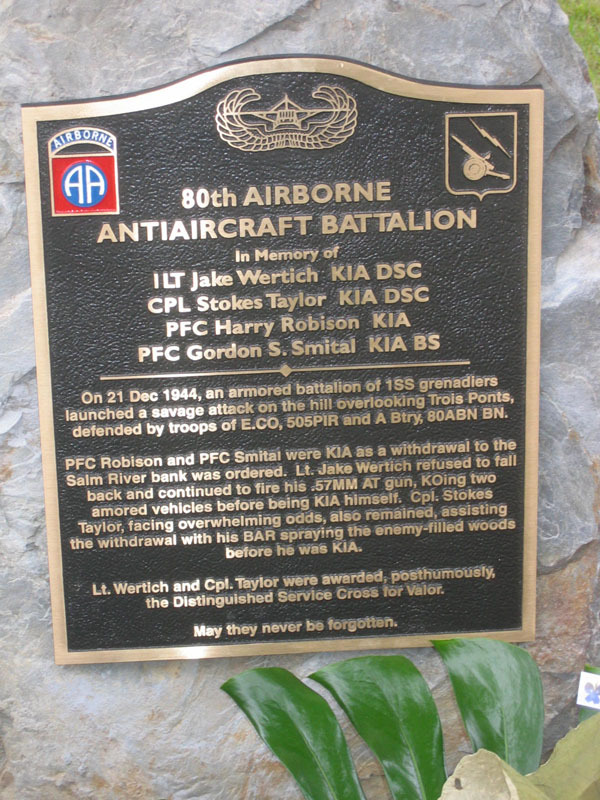 It covers their history with the 505 and other units of the 82nd Airborne Division. A good read with interesting pictures. Interesting Information about the 80th AAA. Sergeant Harold Luken, of the 80th AAA - B company, tells how he shared a foxhole with General Gavin in the Ardennes during the Battle of the Bulge. created by Mr. Ray Fary a veteran of the 80thAAA and Mr. Dominique Potier. 80th Airborne Anti-Aircraft Battalion paratroopers discharged from the 155 AA Battalion, read why. Although the 80th AA's biggest gun was the 57mm, no match for the German 88, they were a very welcome addition to the lightly armed paratroopers. All told, the 80th AA Battalion lost 64 dead of which 5 are not found in the division records. The 80th was activated on September 3, 1942 at Camp Claiborne, Louisiana, as the 82nd Division was being converted to airborne. Personnel came from Companies A and C of the 326th Infantry and from Companies A and B of the 325th Regiment of the 82nd. The first Commanding Officer was Colonel Whitfield Jack. When the 82nd became airborne, the personnel were not volunteers, but were simply assigned. As "anti-aircraft" they wore the braid of the Coast Artillery, but were primarily anti-tank from Africa forward. The battalion joined the 82nd at Fort Bragg and underwent glider training. The battalion was a division resource and was assigned to each of the three regiments as needed. It is probably that at one time or another every battery was assigned to the 505. The battalion consisted of a Headquarters Detachment and six batteries, A through F. Each battery had eight guns and from 70 to 100 men. The first weapons for Batteries A, B, and C were 40mm Bofers AA, then 37mm anti-tank, and in Africa, they converted to the British 57mm, known as the "six-pounder." Batteries D, E, and F retained the 50 caliber machinegun. On April 29th, 1943 the battalion went overseas on the SS George Washington which, along with the Monterey, carried the 82nd. The battalion followed the 82nd through Sicily, Italy and on to Ireland. In England, the 80th AA Battalion was stationed at the Leicester Race Course in Oadby where a commemorative plaque was placed in 1997 in remembrance of their stay there. In Normandy, the first gliders carrying the 80th arrived at 4:03 a.m. Batteries A, B and C flew into Normandy in 42 CG4A and 14 Horsa gliders carrying 24 57mm guns, 28 jeeps, and nine 1/4-ton trailers. Batteries D, E, and F came in by boat from Cardiff. The story is told of one crew near St. Saveur le Vicomte without a gun sight which had to be bore-sighted (aimed by looking down the barrel) to be of value in protecting that location. All batteries went into Holland by glider led by Batteries A and B. There were 126 CG4A gliders, 535 men, thirty-two 57mm AT guns, 52 jeeps, and 24 1/4-ton trailers. By this time Battery E had also been converted to the 57mm gun. Entering Belgium, Batteries A, B, and C first took up defensive positions near Werbonmont. During the Battle of the Bulge one gun of Battery A was left behind to cover movements of the 2nd Battalion 505, when they were overrun and four men were killed. Lieutenant Jake Wertrich and Corporal Stokes Taylor both received the DSC posthumously. While the men of the 80th Airborne AA Battalion had not joined the 82nd as volunteers, they became airborne in every sense of the word. The 80th Battalion remained in the 82nd Division until deactivated in the 1950s. Six guns of A battery supported the 505 PIR's 2nd battalion in the battle for Trois Pont, Belgium.